Boss 2 Yellow Koopa Troopas and a Hammer Bro. 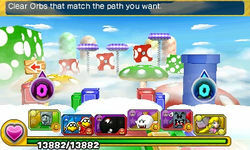 World 1-6 is the seventh course of World 1 in Puzzle & Dragons: Super Mario Bros. Edition. 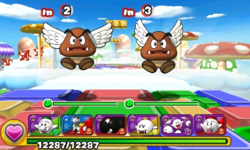 It is a sky level with enemies consisting of Goombas, Paragoombas and Yellow Koopa Paratroopas. When the player enters this course for the first time, the game provides a tutorial of the Orbs' elemental rock-paper-scissors strengths and weaknesses. Clearing this course once unlocks Purple Toad as a Helper. This level starts with a single battle, after which the player reaches a branching path with a sign on the left and a blue Warp Pipe on the right. 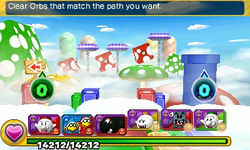 The left path requires the player to clear more Wood Orbs than other Orb types, and the blue Warp Pipe on the right requires more Water Orbs to be cleared. 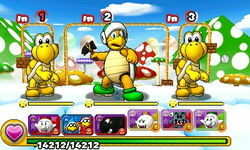 Taking the normal path on the left, the player faces two battles before the boss fight at the end with two Yellow Koopa Troopas and a Hammer Bro. When playing this course for the first time, the Hammer Bro drops a Star Coin upon defeat. Taking the blue Warp Pipe down, the player comes across a ? Block they can open for an item. After opening (or failing to open) the ? Block, the player takes a red Warp Pipe back to the main path and directly to the boss fight at the end. The player has only Fire, Water, Wood, Light and Heart Orbs on the Orb field for this course. The boss battle of World 1-6. Yellow Koopa Troopa (Boss battle) ? 462 -- 49 2 ? ? Hammer Bro (Boss battle) ? 849 1274 (Frenzied Blows) 33 2 ? ? ★World 1-6 is a difficult version of World 1-6 from ★World 1, with Dark Orbs appearing on the Orb field now while Wood and Light Orbs do not. As such, the left path at the branch now requires the player to clear more Dark Orbs than any other to proceed. Yellow Koopa Troopa (Boss battle) ? 3826 -- 565 2 ? ? Hammer Bro (Boss battle) ? 4636 3245 (Light Change), 6954 (Frenzied Blows) 430 2 ? ? This page was last edited on August 13, 2017, at 18:04.